Join me and tangle your blues away … with hues of blue! 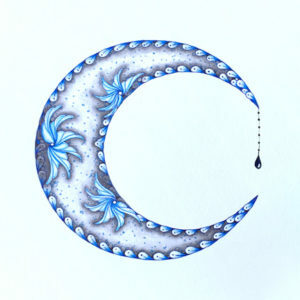 Join me as we tangle a 10.5″ square Opus tile with a blue crescent moon. 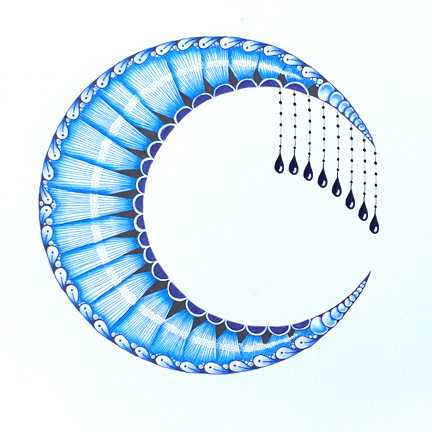 I will have examples of different crescent moons with various tangles, and you get to decide which ones to use to complete your piece. A couple examples are show to the right. 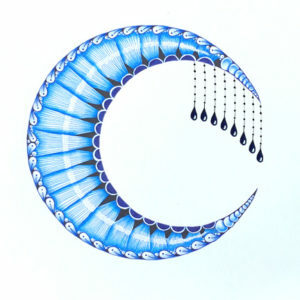 This class kit includes 2 blue microns, the Opus tile, a couple practice tiles, the Crescent Moon template and the prismacolor pencils needed to complete the piece. The course fee is $45. Please remember to bring your black micron pens, your pencil and your tortillion. Let’s tangle our blues away!